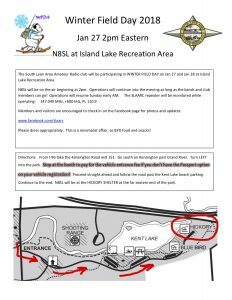 The South Lyon Area Amateur Radio club will be participating in WINTER FIELD DAY on Jan 27 and Jan 28 at Island Lake Recreation Area. Please dress appropriately. This is a minimalist affair, so BYO food and snacks!